One of the safest assumptions on Wall Street is that however high stocks have climbed, professional forecasters will say they can go higher. That’s not the case now. U.S. shares dropped the most in four weeks on Tuesday, pushing the S&P 500 Index down as much as 1.1 percent to 2,147.58. And, for a change, turning to equity strategists was little comfort. As much as they have loved the bull market, a year of stagnating earnings, inflated valuations and confusion about the Federal Reserve has left prognosticators playing an unfamiliar role as bears. The average year-end target among 20 brokerages surveyed by Bloomberg for the S&P 500 was 2,146 on Aug. 1, a level that after yesterday’s 0.6 percent decline is 11 points below the index’s closing level Tuesday. It’s the first time since 2014 that the benchmark has been above the level expected by analysts. Among the analysts surveyed by Bloomberg, 11 expect the S&P 500 to end lower than its closing price on Monday. To be sure, that doesn’t mean they see a bear market — the most pessimistic expectation, set by Ben Laidler at HSBC Securities USA Inc., is for the gauge to end the year down 9.1 percent from Tuesday’s close to 1,960. Still, it’s a departure from the norm, and testament to the speed with which stocks have rallied in the past five months, their longest streak of gains since 2014. Powered by better-than-forecast earnings and weakening odds of a Federal Reserve interest-rate increase, the S&P 500 jumped 3.6 percent in July, reaching an all-time high. 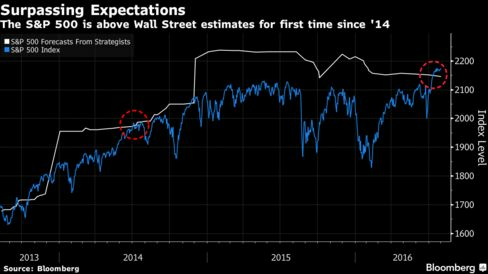 Equity strategists on Wall Street have been a reliable source of enthusiasm, with their year-end projections rarely staying below market prices for long, according to an index compiled by Bloomberg. The group pegged the index level at 2,140 as long ago as in 2014, and has held to at least that level ever since. But that normally steadfast bullishness has withered in 2016 as equities have rallied. A handful of strategists have lowered expectations, sending the year-end average for the S&P 500 to 2,152 from 2,224 at the start of the year. The bear case was most recently extolled by Goldman Sachs Group Inc., where a team of analysts led by Christian Mueller-Glissmann projected the S&P 500 and the Stoxx Europe 600 Index will fall roughly 10 percent over the next three months. The team’s U.S. equity strategist, David Kostin, expects the index to fall to 2,100 by year’s end. “Given equities remain expensive and earnings growth is poor, in our view equities are now just at the upper end of their ‘fat and flat’ range,” they wrote in a note to clients this week. The analysts downgraded stocks to “underweight” for the next three months, while keeping their neutral position over the next 12 months and staying overweight in cash.